Snapped from the International Space Station on Sunday (Jan. 20), this photo shows the National Mall from orbit. Even astronauts in space are turning their attention to President Barack Obama's inauguration today (Jan. 21), snapping photos of the U.S. capital from high above Earth. 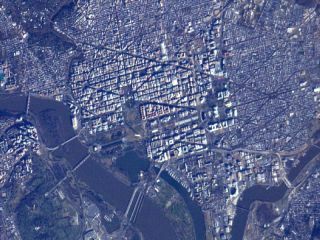 New photos snapped by astronauts on the International Space Station over the weekend show key areas of Washington, D.C., as it appears from 240 miles (386 kilometers) up. Two Americans, Kevin Ford and Tom Marshburn, are living on the station, which Ford is commanding. "This detailed view shows the Potomac River and its bridges at left, with National Mall at the center, stretching eastward from the Lincoln Memorial to the Washington Monument toward the Capitol building, where the inaugural ceremony will be held," NASA officials said in a statement. NASA had a few different events planned for inaugural weekend. A group of the agency's astronauts and scientists—including "Mohawk Guy" Bobak Ferdowsi—will march in the inaugural parade today alongside full-sized models of the Mars Curiosity Rover and the Orion Space Capsule. Taken by Canadian astronaut Chris Hadfield from the International Space Station, this photo shows the path of the inaugural parade on Jan. 21. The space station is currently home to six astronauts representing the United States, Russia and Canada. In addition to Marshburn and Ford, the crew includes three Russian cosmonauts and Canadian astronaut Chris Hadfield. "You can even follow the parade route," Hadfield wrote in a post on Twitter, where he chronicles his flight as @Cmdr_Hadfield. Read NASA's full schedule from President Obama's inaugural weekend here.